Honeywell 8680i allows you to work hands-free with smart Smart 1D & 2D barcode scanner with Bluetooth + NFC for pairing with a mobile computer or network, can significantly speed up your work processes and your operations, 8680i mini mobile barcode scanner computer offers hands-free scanning taps into enormous productivity potential ! Bluetooth + NFC for pairing with a mobile computer or network, scanning & battery status display, robust enough for the challenges of daily warehouse life. ergonomic 8680i Smart Wearable 1D & 2D barcode scanner and Bluetooth and Wi-Fi eliminates wasted motion with always-at-hand scanning to increase high frequency workflow efficiency. The Advanced model further improves effectiveness by delivering essential workflow information directly to the worker’s line of sight. 8680 is a Smart Wearable is a compact, high-performance, hands-free cordless scanner to help businesses improve workflow efficiency. 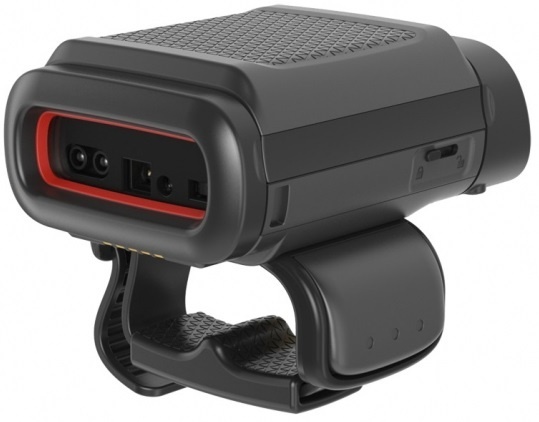 The Standard version offers lightweight, ergonomic Bluetooth®-wearable scanning with clear communication of wireless connection, battery status, and scan results. With Wi-Fi and a customizable user-facing display on the Advanced model, the 8680i Smart Wearable enables streamlined workflows with a single device. Key information can be presented to the worker to drive tasks such as picking, packing, or sorting, and the two-button interface enables task-specific responses (for example, confirm action completion or mark an exception). Efficiently scan barcodes while having both hands free? That's child's play with the 8680i Mini Mobile Computer from Honeywell. This compact, lightweight device may be worn as a ring scanner on your pointer or middle finger, or on a highly breathable glove with cut protection, as needed. Since the scanner does not need to be laid aside that automatically means it does not need to be repeatedly picked up and put down. It communicates via Bluetooth with the host, so that no bothersome cables inhibit the user. Particularly shipping services, retailers, logistics companies and production employees will benefit from the significant increase in productivity that the 8680i provides. In addition to the standard model there is an enhanced variant available with a customizable display on the rear. There, users receive all the information that they need for a smooth workflow at a glance. The enhanced scanner also offers WLAN as a connectivity option, and a software development kit for the development of your own app. That's how Honeywell adapts the 8680i to user needs, right down to the very last detail. Power Cable - Power cable U.S.